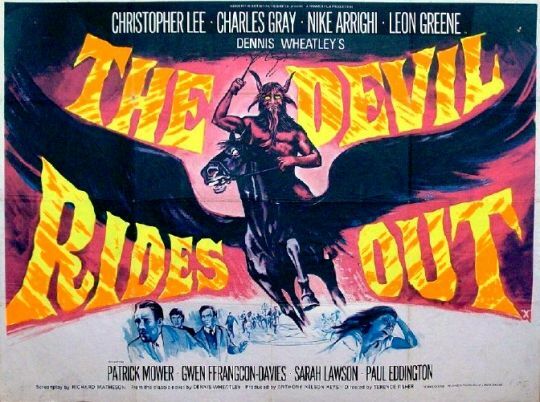 Released as The Devil’s Bride in North America, this 1968 Hammer film is one of sheer delight. Not the least of which is Christopher Lee in a heroic role for a change, and Charles Gray (who I enjoyed in both his appearances in the Bond series, as well as The Rocky Horror Picture Show) as a villainous Satanist. When the Duc de Richleau (Lee) calls on Simon, the son of his late friend with his compatriot Ryan he is shocked to discover that there is a party in progress, one with 13 members. Simon tries to usher them out, but de Richleau investigates the house, including the observatory which has some interesting art decorating its walls and floor. de Richleau puts it together, as he’s dealt with these things before, and knows what is going on here. And he begins a game of wits against Charles Gray’s Mocata, who is apparently loosely based on the intriguing historical figure Alesiter Crowley. The imagery and the design of the film are great, there’s a winged angel of death on a horse, an evil-looking apparition with menacing eyes, the infamous Goat of Mendes, an assault by a giant spider. It’s good fun. I only have a couple of quibbles, the film was shot in the 60s, and is supposed to be set in the 20s. Sadly, it just looks like it was set in the 60s with people dressing like they were in the 20s. But it doesn’t deter from the enjoyment from the film, it was just something that made me go hmmm. The other thing, equally noticeable, is the extra work in the worship and sacrifice scenes. They don’t really make an effort to impede our heroes at all, they look like they want to try, but just with a lot of bouncing in place and waving of their arms. Once again though, it’s not enough to spoil the delight of the film. 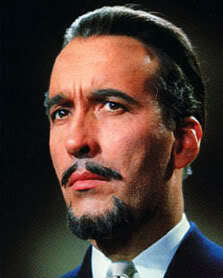 And it was nice to see Christopher Lee as a heroic character for a change! The 101 Horror Movies continues to bring me great movies I haven’t seen before.